Here’s a list of commonly known commercial species of crabs. These crabs are edible and commercially fish. These crabs are expensive seafoods. The Red Frog Crab is a unique-looking crab species. Its scientific name is Ranina ranina. The specimen on the above-photo was caught in Sasebo Seikai Pearl Sea Resort, Nagasaki, Japan. It is also commonly known as Spanner Crab. It can grow up to 15 cm in length and weigh as much as 900 grams. It is sold at a price of 400-500 pesos per kilogram in the Philippines. Bairdi Crab or Chionoecetes bairdi is a crab species that can be found in the Bering Sea. It is also commonly known as Tanner Crab. Commercially, it is called Snow Crab. It can live over a decade and can weigh as much as 1.8 kg. The European Spider Crab or Maja squinado is a weird-looking migratory crab species found in the Atlantic Ocean and Mediterranean Sea. They migrate during autumn with some crabs covering more than 160 km in eight months. This crab is the subject of commercial fishery, with over 5,000 tonnes caught annually. This edible crab is also known commonly as Spiny Spider Crab or Spinous Spider Crab. 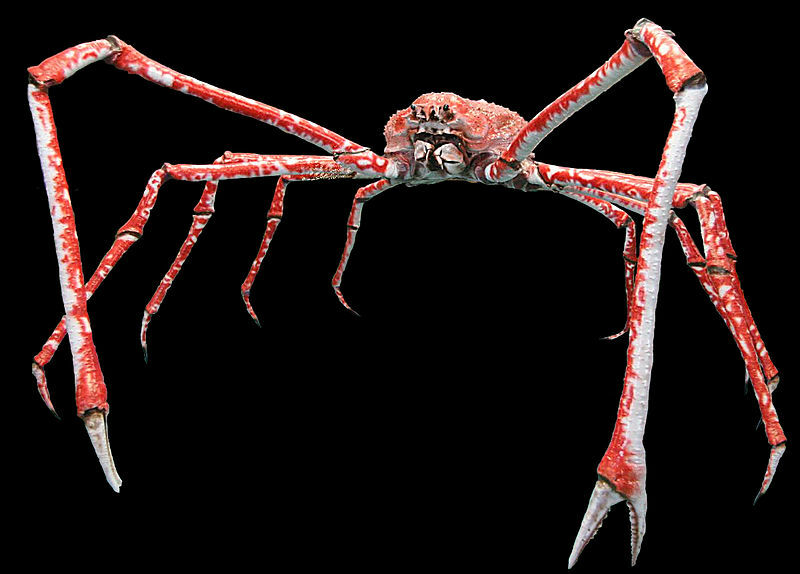 The Japanese Spider Crab is the world’s largest leg span of any arthropod reaching up to 3.8 meters and weighing up to19 kg. It can live up to 100 years and it feeds on shellfish and carcasses. Atlantic Rock Crab or Cancer irroratus is a colorful crab species that can be found in the eastern coast of North America. This edible crab is fish commercially. The Dungeness Crab or Metacarcinus magister is a colorful species of crab that inhabits eelgrass beds and water bottoms on the west coast of North America. It can grow to 20 cm across the carapace. This popular sea food common name comes from the port of Dungeness, Washington in the US. The Jonah Crab or Cancer borealis is a commercially significant crab species that can be found on the Atlantic coast of North America. This crab with strong claws but not very aggressive has been fished on a small scale since the 1970s. Around 1,500 tonnes of Jonah Crabs are being caught annually. The Red King Crab or Paralithodes camtschaticus is probably the most popular and one of the largest commercially important crab species in the world. This crab, which is endemic to the Bering Sea, can attain a leg span of up to 1.8 meters. Red King Crab is heavily targeted by fisheries. The Blue King Crab or Paralithodes platypus is another large crab species. It can be found near St. Matthew Island, the Diomede Islands and the Pribilof Islands in Alaska and along the coast of Russia and Japan. Blue King Crabs from the Pribilof Islands are the largest of all the king crabs. They can attain weight of up to 8.2 kg and are commercially harvested. Southern King Crab or Lithodes santolla is a large king crab species found off the Pacific coast of South America where it is known as Centolla. It is a commercially significant crab species. Most of these crab species I don't know about. Thanks for sharing your knowledge. I can't believe you skipped the Chesapeake Blue Crab, Callinectes sapidus. It's the Maryland state crustacean (really!) and practically the mascot of Baltimore (where I'm from). It grows not only in Chesapeake Bay but along the Atlantic coast and the Gulf of Mexico. It has been transplanted to other areas such as the Mediterranean, where it has also become commercially important.